Buellia badia (Fr.) A. Massal. Nash, T.H., Ryan, B.D., Gries, C., Bungartz, F., (eds.) 2007. Lichen Flora of the Greater Sonoran Desert Region. Vol 3. Thallus: crustose, bullate to subsquamulose becoming distinctly squamulose, thick, ±continuous or becoming dispersed; prothallus: absent surface: usually deep brown ("chocolate"), rarely grayish brown, shiny or rarely dull, smooth, epruinose, rarely pruinose, phenocorticate, with thin epinecral layer of dead cells, esorediate medulla: white, lacking calcium oxalate (H2SO4-) Apothecia: lecideine; (0.3-)0.3-0.8(-0.9) mm in diam., soon sessile margin: black, thin, rarely persistent, usually excluded with age disc: black, epruinose, initially plane, usually becoming strongly convex with age proper exciple: narrow, poorly differentiated, aethalea-type, inner excipular hyphae narrow, hyaline, prosoplectenchymatous (textura oblita), often reduced, similar in structure and orientation to the paraphyses, transient with the deep reddish brown hypothecium (leptoclinoides-brown, textura intricata), outer excipular hyphae parallel, moderately swollen (textura oblita) and usually strongly carbonized with various amounts of a brown pigment (cf. elachista-brown, HNO3-) epihymenium: brown, pigmentation continuous with the outer exciple (HNO3-) hymenium: hyaline, not inspersed with oil droplets; paraphyses: simple to moderately branched, apically swollen, with a brown pigment cap (cf. elachista-brown) asci: clavate, ±Bacidia-type (central cone with parallel flanks), 8-spored ascospores: soon brown, 1-septate, oblong to ellipsoid, usually not constricted, with obtuse ends, not curved, (10-)10.5-[11.9]-13.2 (-15) x (5-)5.8-[6.5]-7.3(-8) µm (n=200); proper septum: narrow, not thickening during spore ontogeny, but young spores often thick-walled (Buellia-type); ornamentation: overmature spores faintly microrugulate (in DIC) Pycnidia: rare, urceolate to globose, unilocular, at maturity lined with short, barely branched conidiophores; ontogeny similar to the Umbilicaria-type conidiogenous cells: terminal, not intercalary (conidiophore-type V) conidia: bacilliform, 3-5 x 1-1.5 µm (n=50) Spot tests: all negative (K-, P-, C-, KC-, CK-) fluorescence: UV- (dark) iodine reaction: medulla non-amyloid Secondary metabolites: no substances detected in independent thalli; parasitic thalli are difficult to isolate and may contain substances from the host lichen. Substrate and ecology: epilithic, initially usually parasitic on a variety of crustose and foliose lichen genera, eventually establishing independent thalli over rock (HCl-), more rarely on decorticated wood, very rarely on bark World distribution: Europe, northern Africa, and North America Sonoran distribution: widespread but not common in Arizona, southern California, Baja California, Baja California Sur, Sonora, and Chihuahua. 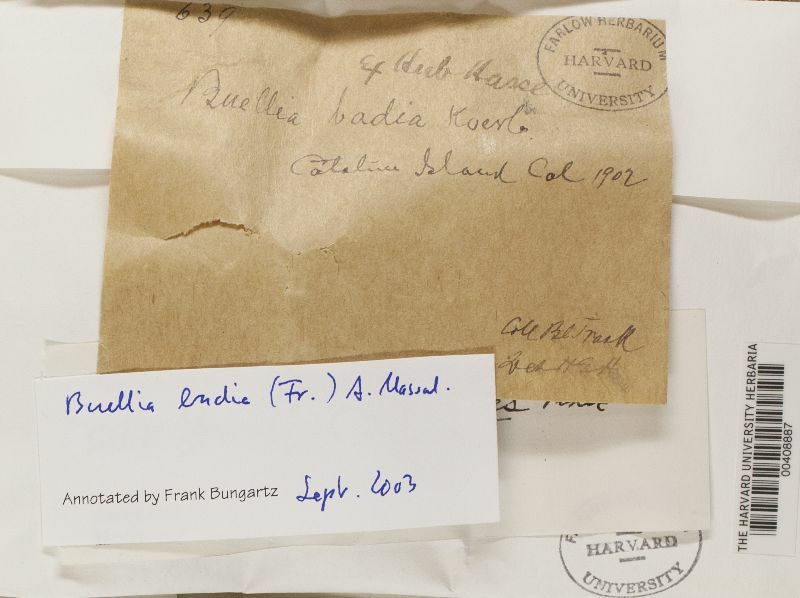 Notes: Buellia badia is very closely related to the coastal Dimelaena californica (H. Magn.) Sheard, which also forms a deep "chocolate" brown, subsquamulose to squamulose thallus. Like B. badia, it initially grows parasitically. However, D. californica appears much more restricted in its choice of host lichen, typically observed on Dimelaena radiata. Unlike B. badia, Dimelaena californica has not been found on wood or even bark. Both species have spores that are very similar in size, shape and structure: they are broadly ellipsoid, initially with evenly thickened walls that become thinner with maturity, and have no conspicuous wall ornamentation. The only significant differences between the two species are (1) the host preference, reflected in a different distribution pattern, (2) the initial formation of a thalline exciple in immature apothecia of D. californica , and (3) the presence of norstictic acid in D. californica . In B. badia, norstictic acid has only been observed very rarely, most likely as a contaminant from host lichens. Otherwise both species are extremely close, and, like in the case of Buellia tesserata and Dimelaena radiata, the placement of both species into two separate genera is most certainly artificial. Marbach (2000) and Kalb (2004) included B. badia in the monotypic genus Monerolechia, arguing that its ascus structure is significantly different from Buellia. Because of their wide central I- cone and ±parallel I+ blue flanks, asci of both B. badia and Dimelaena californica are indeed slightly different from the typical Bacidia-type ascus that is usually observed in Buellia. We are, nevertheless, not convinced that this slight structural modification represents sufficient evidence to accept Monerolechia. 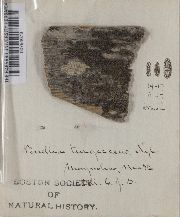 However, if Monerolechia was accepted, both B. badia and Dimelaena californica should be included together in this genus.